A mathematician is performing a probability experiment. Starting from 0 (zero) on the integer number line, the mathematician flips a coin and takes one step to the right if it comes up a head or one step to the left if a tail. This process of flipping and moving either right or left is repeated for a given number of flips of the coin. This project computes the probability of ending the walk at position p after f flips of the coin. Here is a screenshot reporting the probability of ending a random walk at +3 after 5 flips as 5/32 instead of its decimal equivalent 0.15625. Note that the screen shows the positions that can be reached for a given number of flips as red-rimmed black circles. Those that cannot be reached as a function of the number of flips are represented as white circles. 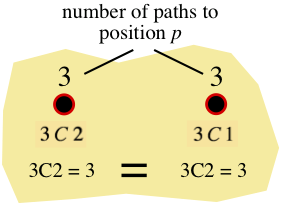 The number of possible paths to each possible position for a given number of flips is shown as a number above each possible position. It’s an interesting fact that these numbers are given by Pascal’s triangle and the nCr notation for combinations computes these numbers. The screen also shows that the totals number of possible paths for a given number of flips is a power of 2. The probability for ending a walk at position p after f flips is the number of paths to position p divided by the total number of paths for the given number of flips. 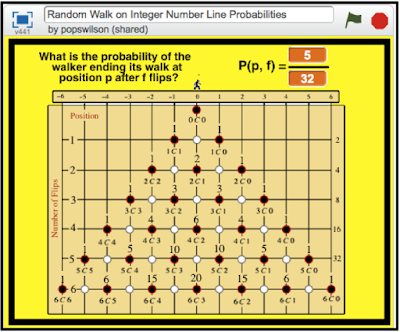 This is the link to this project, Random Walk on the Integer Number Line Probabilities. A detailed explanation of the mathematics and the programming used in the project, including a couple of additional programming simplifications, are detailed in document that is available at no cost by sending an email request to grandadscience.com. This Scratch project needed a power of 2 script, a factorial script, and a nCr script that are available as separate Scratch projects by clicking on the links as shown below. 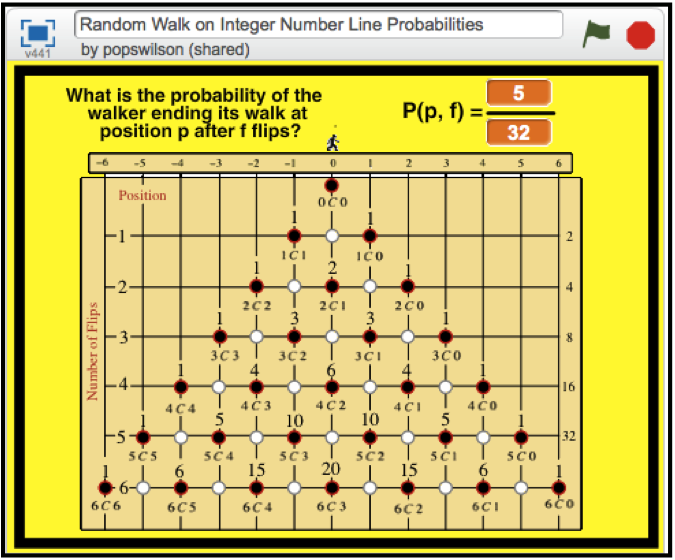 These are the links to my other Random Walk on the Integer Number Line projects.